Mimi Malaho and her family help bring basic health care to their community. By making small changes like sleeping under mosquito nets and big ones like building a clinic with outside help, the Malahos and their neighbors transform their Kenyan village from one afraid of illness to a thriving community. In an engaging and vividly gripping narrative, Katie Smith Milway allows the reader to travel to a rural village in western Kenya and experience life for the everyday family. The narrative is through the eyes of Mimi, a young, intelligent, curious and compassionate girl who represents millions of other little girls just like her in many remote villages of rural Africa. The story line highlights the challenges presented by lack of clean water, health care facilities, poor infrastructure, illness and poverty. Mimi’s little sister falls ill after drinking dirty water from a stream causing anxiety in the family. Perhaps she may end up losing her life? Mimi has worries; she is aware of the dangers of stream water “[it] has to be boiled before they can drink it.”(6) Such worry is legitimate as this happens when another family is mourning their little one. Child mortality is high because as the author accurately depicts, there is no doctor or nurse to call for help when illness arises. Simple cures are not readily available; the family has to travel for days to get to the closest health care facility. But when they do, Nekesa, Mimi’s little sister gets the care she needs and thankfully her life is spared. The clinic is small, with minimal staff, but provides the help and preventative medicine and education that the villagers need. 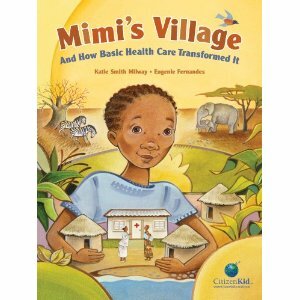 Besides, highlighting the challenges of life in Mimi’s village, the author speaks to how communities can bring change by working together. Mimi is the little change agent. Her dream of having a clinic in the village comes true after her village pulls together to build one. The best part about this book is how the author has been able to highlight serious issues of developing countries in a simple but powerful narrative. The reader is able to empathize with Mimi, her family and the community at large. There is also a lot learned about the culture of the people: the food, dress, dance, and history because the author integrates these nuances throughout the book. The illustrations compliment the message and allow the reader to visualize the words and make meaning of some of the descriptions. They are well placed in context and the reader is able to draw meaning from them. This book talks to the importance of educating ourselves about challenges faced by communities around the world. The simple necessities of life like clean water, preventative care, and good nutrition may not be that simple for folks around the world. The story also brings to light the warmth, hard work, and community spirit in these communities, challenges not withstanding. Teachers can use this book to teach about global health, culture, and philanthropy. One little voice can go along way in bringing change, and when people work together good things happen. Because the author has managed to tell a story in a way that is not necessarily “childlike,” adults can find this a good read too. It is thought provoking and allows for self-reflection- how much people in developing countries have compared to those in developed countries. A good lesson for both children, and adults. in this story. Nevertheless, I highly recommend that schools and libraries buy this book. Not only is it a good read, it is also very educative. Next story Next Stop Zanzibar Road!